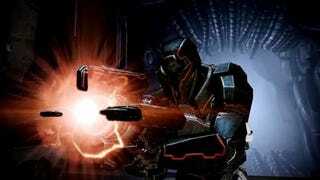 In this video, you can get a look at the in-game bonuses for preordering Mass Effect 2 from GameStop: the Terminus Assault Armor, which does more than look good, and the Blackstorm Heavy Weapon, which does more than look bad. See, this is what everyone said those folks in Switzerland were gonna do, create a bunch of Junior Mint black holes that will tear up this dimension. Apparently, in the year 2185, they have figured out how to safely create beachball-sized singularities. Well, they're not safe for the bad guys who get caught up in it, but that's their problem.